VauxWall East Climbing Centre is our second climbing wall for Central London; just 10minutes walk from the original VauxWest site behind Vauxhall Station. Located within a grade-II listed school assembly hall from the 60’s, within a private residential estate the centre has that exclusive ‘in-the-know’ feel. We are centralised between 3 tube stations serving different lines: Vauxhall (Victoria), Kennington (Northern) and Lambeth North (Bakerloo) and are also a 20 minutes walk from the National Rail Waterloo station. Check travel times from Underground Stations to any station close to VauxWall East here. 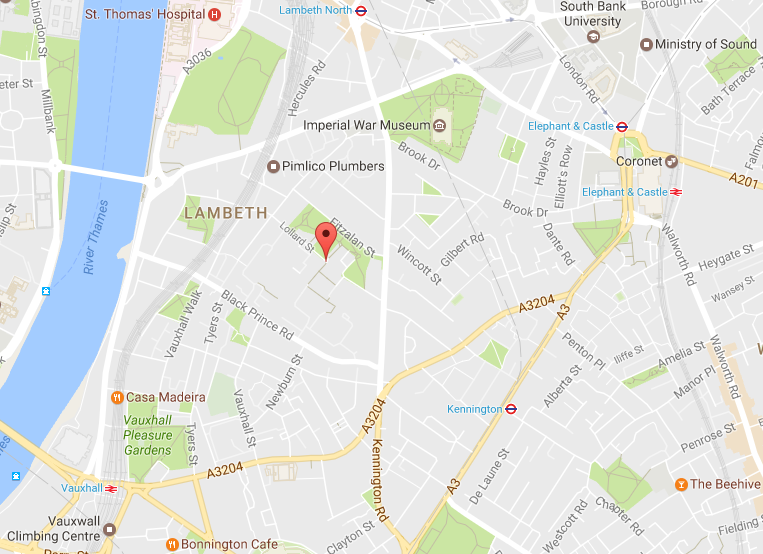 Click here for an interactive London Underground map and how to get to VauxWall East from where you are. You can download a pdf of the London Underground here. Vauxhall station provides regular services operated by South West Trains between London Waterloo and south-west London destinations including Richmond, Wimbledon and Hounslow. Elephant & Castle rail station offers First Capital Connect Thameslink and Southeastern services to destinations including St Pancras, St Albans, Luton, Sevenoaks, Wimbledon and Sutton. Click here for an interactive map of the South West Trains network. Bus routes available within 1/2km to the Centre are: 3, 59, 77, 159 (24 hour service), 344 (24 hour service), 360, 507, C10 and Night Bus route N3. Click here for for routes and times. Fitzalan Street, Black Prince Road and Kennington Road which connect to the Cycle Superhighway 8 on Millbank and Cycle Superhighway 7 on Kennington Park Road. There is cycle storage directly outside the centre. Plan your route to VauxWall using this Cycle Journey Planner. There is a Santander Cycle Hire directly in front of the centre on Lollard Street. Alternatively there is further Cycle Hire on Black Prince Road, 5 minutes walk to the Centre. For the location and availability click here. Parking is limited in the area. There is no onsite parking available at the centre. There is some pay and display parking on Juxon Street. Cost is £4 per hour and the maximum stay is 4 hrs.